To put it frankly, Joakim Noah put on one of the great playoff performances in Chicago Bulls history on Monday, not necessarily production-wise but because of what it meant both in the moment and in the swirl of opinion around him and the team. Playing off a bad plantar fasciitis, Noah set the physical tone from the post (Kirk Hinrich doing so from the perimeter) in the Bulls’ 90-82 win in Game 2 versus the Brooklyn Nets, which evened the series up at 1-1 and set the Bulls up for a chance to take control of the series starting tonight at the United Center for Game 3 (7:30 pm central). What made Noah’s performance truly special starts in the moment, as excerpted in the video above, where he took over late in the game. Over the final 7:39 minutes of the game, Noah scored nine points, six rebounds and his game-defining block on Brook Lopez- those contributions all the majority of his 11 points, 10 boards and two blocks. The big man’s physical prowess in the face of assured pain was a showcase of sacrifice for a team that looked woeful just two days before, a team looking like it was volunteering for a four-game sweep. That story line writes itself, but making it even juicier was the fact that on the sideline while this was happening, the Bulls’ franchise sat in his updated prom suit, showing fast twitches in celebration that observers thought would be of better use in basketball shorts in the space a few feet in front of where he stood (and jumped for particularly good plays). Though his career has had a certain forward momentum throughout, this year was a particular tipping point for the pony-tailed one. It was expected that Rose was not going to be a part of the Bulls’ proceedings for at least the half-way section of the season back when the season was in its infancy, so it was only natural to expect more of each Bull no matter their station on the squad. For Noah, more meant treating this situation like the opportunity to shine that it was- to not just be a facilitator and a defensive stopper, nor a goofy pothead or a seersucker-dressing free spirit– it was time to be a star. Noah proceeded to do his thing, becoming not just a star, but an All-Star for the first time, averaging over 11 points and rebounds a game for the first time as well as his first time over two blocks a game and a career-high of four assists a game, blowing away his previous best of 2.5 apg in the previous season. Noah has become Charles Barkley’s favorite player and he has been the immediate draw for those outside Chicago when they get to see the Bulls on national TV and such. Monday was such a showcase and it was the kind of showing that the Bulls have not often got from their post players; past postseason highlights mostly came from the perimeter (Mike, Scottie, take your pick). That block though, that block had Tom Boerwinkle in its DNA, it had his scrappiness and overachieving nature as well as that of Van Lier, Sloan, Love and later Rodman and Cartwright and Longley, to bring it back closer to Noah’s position. The red face, the primal scream (take note Boozer: only do it after a real difference-making play), it indeed told a story as old as the franchise itself, as the city itself– do what you got to do to survive, make it happen no matter what suffering comes along with it. 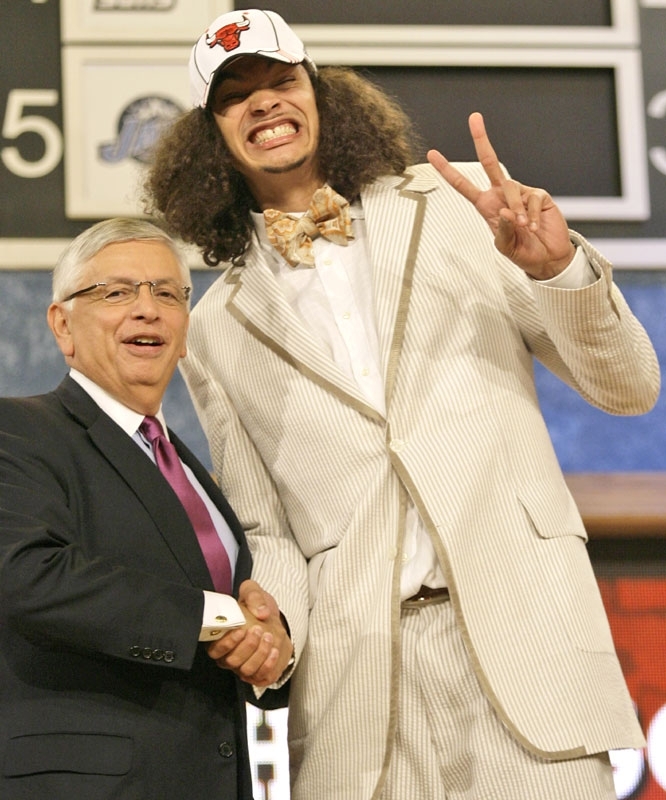 Joakim Noah is my favorite Chicago Bull right now and he should be yours too. But what of the old favorite, the still-young conqueror, dissected so much physically and mentally over the past 12 months? Just who is Derrick Rose now? Who does he want to be? People throw his words back at him now, his past declarations to give his life for his team and the game are seeming like sweet bait for those who troll in various media. Well, here’s someone who’s giving it up for real, they say, what have you to offer when it really matters, D-Rose? All printed before game 2, so each quote should be seen in that context: that game erased the final quote about weakness, which was pretty ridiculous in the first place. If there’s one thing the Bulls have in spades is toughness– Noah, tough; Lil’ Nate, tough and bold; Deng, often plays hurt and plays as much as anyone period; Jimmy Butler, Hinrich- tough as hell and hard workers to boot. The other points about Rose answering for himself — well, as it is with any personal or semi-personal situation, Rose doesn’t owe the public anything, but he will have a hard time getting full understanding from the general public regarding what happened this season until he lets the public in on his thinking and reasoning for not playing and how he went about not playing. The little drips and drabs of information, the contradicting percentage estimation of readiness, rising and falling like the dow while only admitting that he’s waiting for that rare feeling of 110% to come across him. “But does it feel awkward for him to watch his teammates playing through unbearable pain?,” Harper writes. Later Harper admits that Rose doesn’t have the luxury of relative role players like Ricky Rubio and Iman Shumpert, who both tore ACLs of their own around the time Rose did and have played much of this current season. And that’s the crux of this issue and likely where the eventual answer lies: did Rose really think that his team was fully equipped to win this year? Did it really matter if they did win or not this year at all? Maybe coming up as short as they have in the past couple years have colored Rose’s view of what it truly takes to win in this league, as his brother Reggie so artfully let everyone know around the trade deadline. Still, it’s not like Rose is out the door, or looking towards the front like Extra P.
Rose has always had a bigger vision than we’ve been led to believe. We underrate his intelligence and cunning because of his supposed unwillingness to take the SATs, and later, the humble packaging he’s been wrapped up in while superstardom defined him otherwise. This is a guy who’s always had the hopes and dreams of at least several people on his back– currently it’s that of millions of #seered hash-tagging, 90s-reminiscing Bulls fanatics who can’t see the forest for the trees (and the sap that runs from them). The AP’s Jim Litke put to good use the semi-literate ramblings of absolutists on Twitter who see the result of one situation and apply it to any other one without any thought in his column on public opinion turning on Rose. Litke, a certified authority on Chicago sports, ended his column with a plaintive “shame” on all those who have turned so swiftly. We don’t have to be soft on Rose, we can question and probe, but to throw him out with the many flops in Chicago sports history and paint him as some overpaid prima donna who doesn’t share the DNA of 1,000 ballplayers and dreamers from Englewood — past and present, those who escaped and those who the city swallowed up — in him… please. 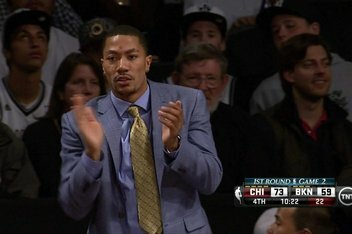 If there’s gonna be some sort of concerted effort from the so-called Bulls Nation to run D-Rose away from the city and the franchise he loves so much just because he is a shade more than cautious with his future (and thus that of the Bulls, hello…) then that’ll be the time I separate myself permanently from anything considering itself fandom. My dissertation on the playoff madness surrounding the Bulls right now.